Production Company: Hodkinson Films. Transfer Note: Copied at 18 frames per second from a 35mm tinted nitrate print preserved by the Academy Film Archive from source material provided by the New Zealand Film Archive. Running Time: 13-1/2 minutes (silent, no music). As scandals rocked Hollywood in the early 1920s—the suspicious poisoning of Paramount star Olive Thomas followed by the scandalous Fatty Arbuckle trials—the American movie industry teetered on the edge of a public relations disaster. Speaking before the Motion Picture Directors Association in September 1921 (six months before the sensational murder of its president, William Desmond Taylor), William Wadsworth Hodkinson, a founder of Paramount Studios, argued that Hollywood needed to “fight for certain standards of cleanliness and decency…that you want preserved in your home and in society generally.” In early 1922, amid growing calls for national censorship, Hollywood recruited Will Hayes, the sober Postmaster General of the United States, to head the new Motion Picture Producers and Distributors of America. His mission was to encourage the movie industry to police itself and turn around public opinion. This unidentified reel, titled “Hollywood Snapshots” in the New Zealand Film Archive inventory, dates from shortly after Hayes’s arrival. It follows Hezekiah, a visitor from the sticks, who searches through Screenland for scandal. But instead of wine, women, and song, the country rube encounters denizens reading books, playing with pets, pampering children, and attending church. Over the course of his trek across Beverly Hills and Hollywood (explored here by silent film locations expert John Bengtson), he meets several dozen lesser-known celebrities—Carter De Haven, Katherine McGuire, Viola Dana, Jack Kerrigan, Owen Moore—visits landmarks, and enjoys scenes from The Four Horsemen of the Apocalypse (1921) and the now-lost Trifling Women (1922). Finding that movie stars are a wholesome lot—and at bottom remarkably like the folks back home—Hezekiah leaves town, a wiser man. “Hollywood Snapshots” makes its point by grafting a simple storyline onto the format of the popular film-fan newsreel showing screen celebrities at work and at play. In an informative illustrated research paper, Paramount archivist Charles Stepczyk argues that this fascinating example of Hollywood spin control was made as a community service for the motion picture industry. He traces the HF logo of the intertitles (center, bottom frame) to Hodkinson Films, concluding that Hodkinson would have had the clout to exact cooperation from the several studios linked with the pictured stars. Many thanks to Charles for his excellent film history detective work! 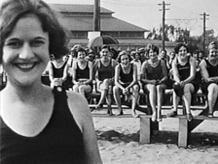 “Hollywood Snapshots” was preserved under the direction of the Academy Film Archive from a nitrate print discovered in 2010 at the New Zealand Film Archive. With support from the Save America’s Treasures grant, received by the NFPF the following year, the 35mm tinted print was scanned at a high resolution and output to 35mm polyester film stock at Colorlab. For other examples of silent-era Hollywood promotional films, see the extras in Flicker Alley’s two-disc The Valentino Collection.